Hydrus, the Water Snake (as opposed to the ancient constellation Hydra, the Water Serpent), sprawls across the center of the picture. The bright star to upper right is Achernar in Eridanus. To the left of it is Alpha Hydri. Gamma resides left of center, while Beta lurks at lower center. Surrounding Hydra are (counterclockwise from the top) Reticulum, Mensa (center left), Octans (lower edge to left), Tucana (lower right), and southern Phoenix (down and to the right of Achernar). 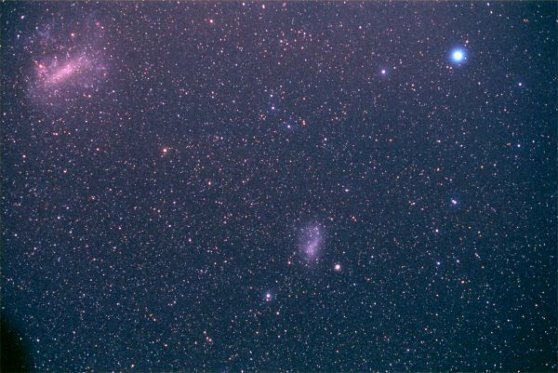 The picture is dominated by the two Magellanic Clouds, which are companion galaxies to our own. The Large Cloud (LMC, 160,000 light years away) is to the upper left, while the Small cloud (SMC, close to 200,000) is just below center. The giant Tarantula Nebula (30 Doradus) lies brightly at the LMC's upper left corner. Just down and to the right of the SMC is the magnificent globular cluster 47 Tucanae. The bright double toward the right center edge is Beta Tucanae: Beta-1 and Beta-2 combine to make the brighter of the pair, while Beta-3 is the fainter. Alpha, in western Tucana, is off the picture down and to the right of Beta. Theta Tuc is the first star up and to the right of 47 Tuc. Zeta Reticuli is the elongated double star just to the left of top center. Beta lies down and to the left of it, while Delta and Gamma Ret (seen also in Eastern Reticulum) lie up and to the left, but off upper edge of the picture. Far southern Horologium is to the right of Reticulum, Beta Hor down and to the right of Zeta Ret. Image courtesy of Chris Picking, Starry Night Photography. See the detail around Achernar. Hydrus has a star with an orbiting PLANET.